The past and the present converged this weekend as former and current members of the Wabash Glee Club prepared for their Homecoming Concert. For the seventy alumni in attendance, it was a chance to reflect on old memories and reconnect with classmates, while doing something they all loved. For the students, it was a chance to bond with former glee club members and learn more about what they all have in common. 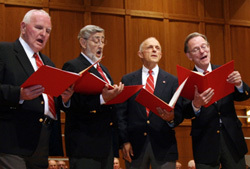 "Music is amazing," Glee Club Director Richard Bowen told the a full house in the College's Lewis Salter Concert Hall. "As we get older, maybe we can't run the 100-yard dash like we used to, but we can still sing. And at the end of the evening, everybody wins." The first Glee Club Reunion was in 1975. The last one was seven years ago. The reunion festivities began with a buffet dinner on Friday evening. After various rehearsals, parties, luncheons, and performances, the combined glee club came together Saturday night in Salter Hall to sing more than a dozen songs under Glee Club Director Richard Bowen and former directors Frederic Ford and Professor Music Larry Bennett. With the different generations of Glee Club members in attendance, from the class of 1941 to the class of 2011, the nostalgia in the air this weekend was potent. 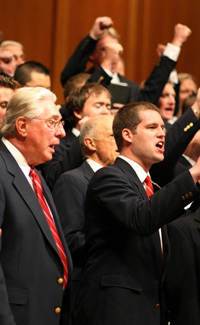 "I think this is a wonderful experience," said Glee Club Secretary Patrick Griffith ’10. "It’s the only time I’ll be able to experience this as a student at my time at Wabash, and I’m really excited about it. I’m going to be singing in a choir of a 150 voices or there about and I think it’s just awesome." "I love the opportunity to come back and sing," said Joe Little ‘86. "It’s a wonderful experience to get to hang with other guys who have done this over the years and to get to sing with my dad is a wonderful thing. My dad is class of 1959. It’s just fun. The music brings back memories of other times we’ve song this. And to get to relive those memories is a wonderful, wonderful opportunity." "Bob Mitchum was our glee club director," said Fred Lacosse ‘56. "He was six feet one inch and an ex-marine. He was our guy. He had gone to Butler’s music school and gotten to know the Four Freshmen. I sang in a quartet here, the Wabash Harmonaires, my sophomore, junior, and senior years. We sang a lot of that close harmony stuff that Bob Mitchum brought to the table. Those are some of my really fond memories, singing with that quartet. We didn’t have any big tours overseas. Our biggest tour was two nights in Chicago. That was it." As the former Glee Club members recounted their experiences and reflected on what the reunion meant to them, current members showed their respect for tradition it all represents to them. "I think it’s a great thing that alumni are coming back to see the campus and uphold the traditions here," said Stephen Kleitsch ‘11. "It means a lot to me that there are traditions on this campus. It makes Wabash, Wabash"
"I think it’s really great that all these guys are coming back," said Josh Watson ‘11. "It really shows that they really do love and support this college. A lot of these guys are coming from really far away and at their own expense just to sing with us and uphold the traditions that are Wabash." "This is great," said Mark Stutz ‘77. "The very first one of these would have been 1975. I was here at school. We had a load of fun doing that. And I always said I’d try to come back for all of these that I could in the future. Most of us have song a lot of this music before. So we’re not learning anything new. We’re reliving a lot of memories, seeing old friends, and it’s great to see Fred Ford who directed the Glee Cub when I was here. "It’s another excuse to come to campus but it’s for something that was a lot of fun; something that was a big part of my Wabash experience when I was here and to relive that brings back the entire experience."